Do the lifestyle guru’s techniques work for the classroom? It seems as though almost everyone is decluttering and organizing their homes, thanks to Marie Kondo and her books and Netflix series about The Life-Changing Magic of Tidying Up. 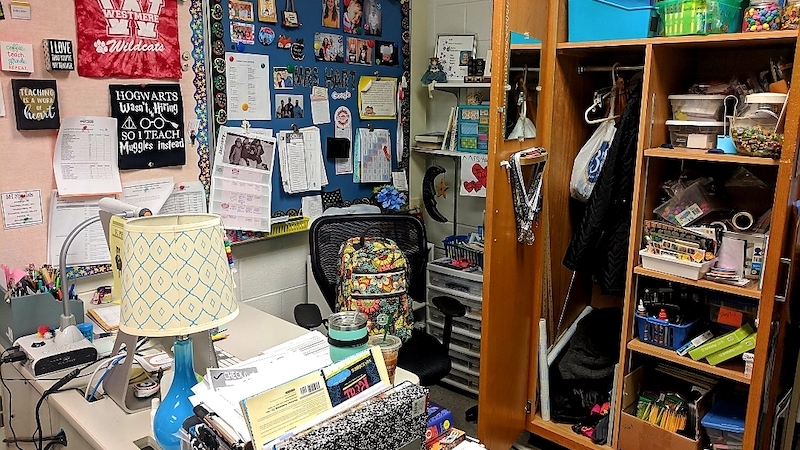 For teachers and their students, the classroom is a home away from home. And what classroom couldn’t use a little tidying up? But what teacher has the time or energy to follow Kondo’s mindful, systematic approach? To hold every book, every piece of paper and curriculum and decide whether it “sparks joy”? What teacher finds discarding things easy? And, most horrifyingly, who gets rid of books?! As a former teacher and current children’s book author, I understand the difficulty, the doubts. 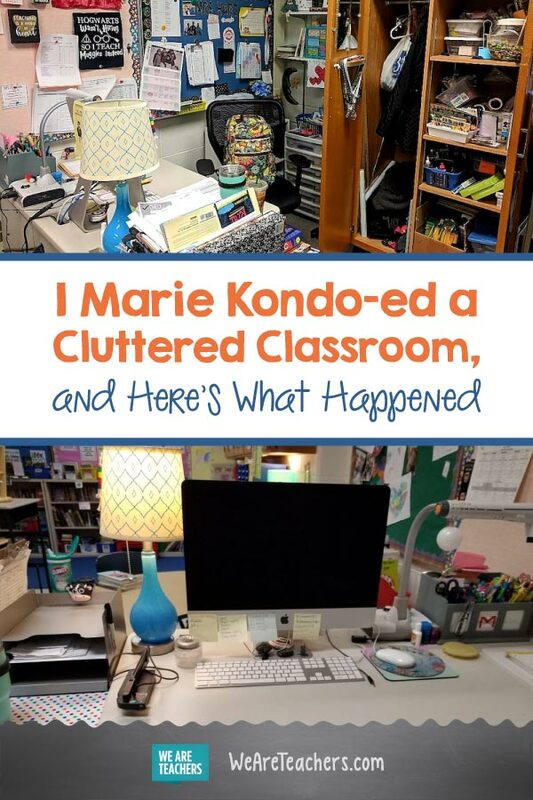 However, as a KonMari fan since 2013, I was also convinced that “Kondo-ing” a classroom would make a positive difference! But I didn’t have my own classroom to try the “life-changing magic” on. 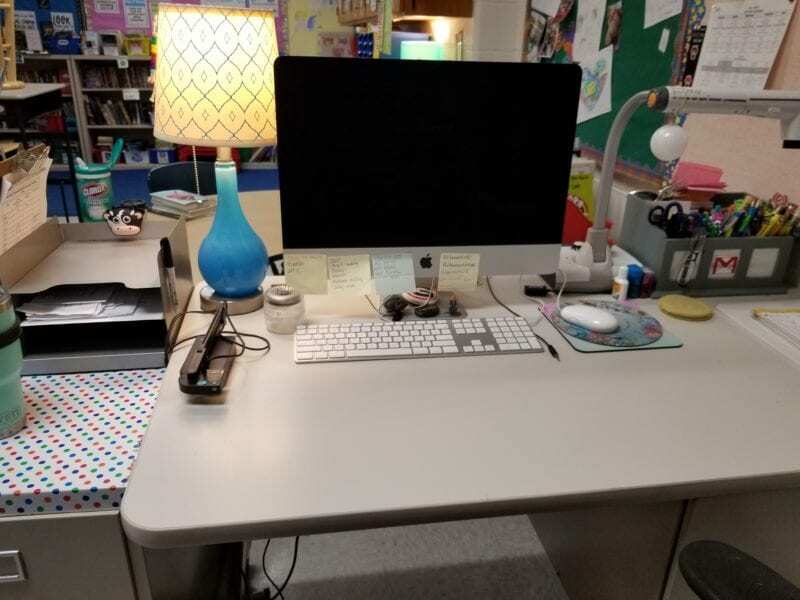 Enter Cheri Hart, fifth grade teacher at Westmere Elementary in Guilderland, New York. I had only met Cheri through Twitter. But her school was only a few miles away from my home, and she was obviously a creative and enthusiastic teacher, so I approached her with my idea. In a home, Marie Kondo starts with clothes, but that wasn’t applicable in the classroom. Kondo’s next category was books—Cheri almost hyperventilated at the mere thought of choosing which books should stay or go. So, we quickly agreed that the books were to be classified as “sentimental items”—the category Kondo saves for last. We would begin with papers. 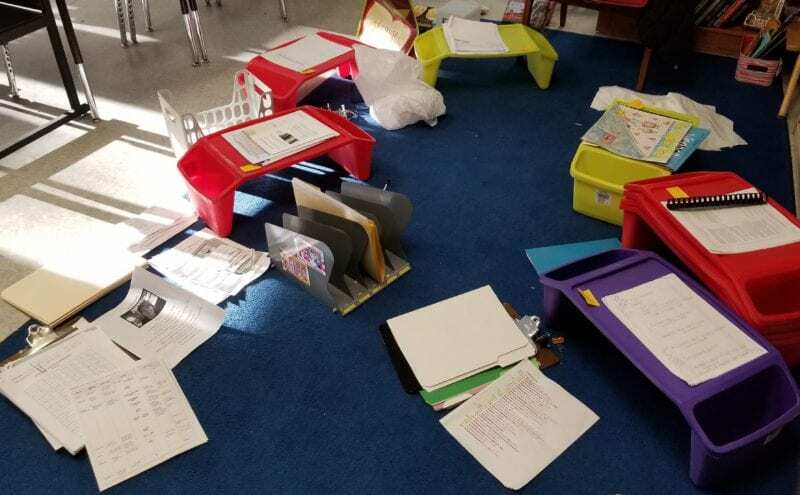 We hit every corner of the classroom, gathering everything that could qualify to be in the paper category—student work, teaching manuals and materials, notebooks, workbooks, handouts, notes. Then we piled it ALL onto the reading rug. It was an intimidating mountain, but Cheri bravely forged on. Cheri held each paper, one by one. If it had served its purpose and was no longer needed, Cheri followed Kondo’s rule and said thank you and put it in the large recycling can borrowed from the custodian for the afternoon. If Cheri still needed or wanted it, she put the paper or paper item aside for the moment. With coworkers and teacher friends drifting in and out to spectate, we worked on. As Cheri got used to making decisions, the pace sped up. Finally, everything that needed to be discarded was in the recycling bin. Next, we had to find permanent “homes” for the remaining papers. 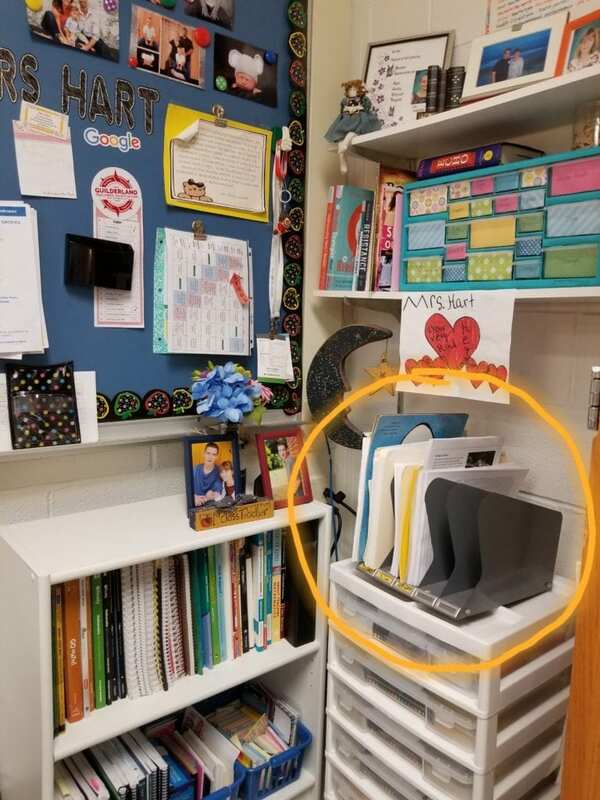 Cheri had already designated places for different subjects, so following the Kondo rule “place like with like,” she put science, ELA, art paper, etc. 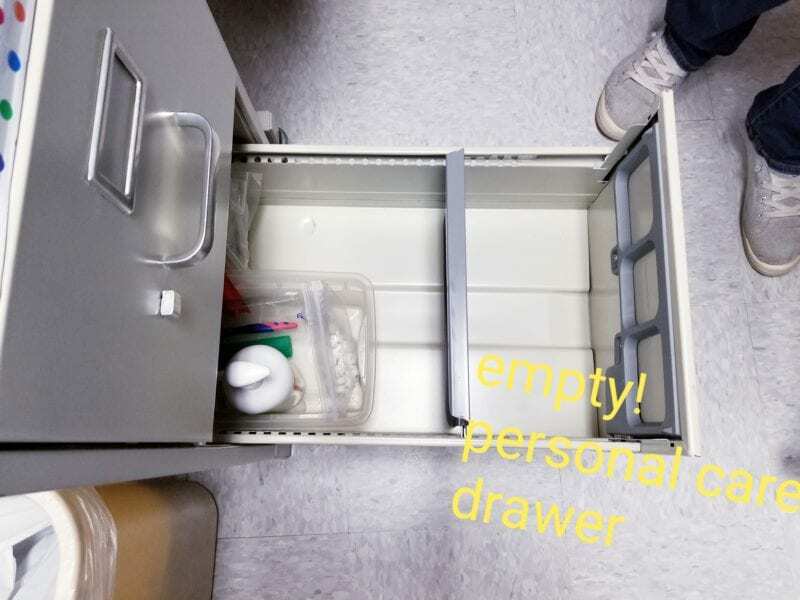 in their respective bins, cabinets, or drawers. Where possible, I had Cheri store things vertically, which saves space and ensures things don’t get buried. 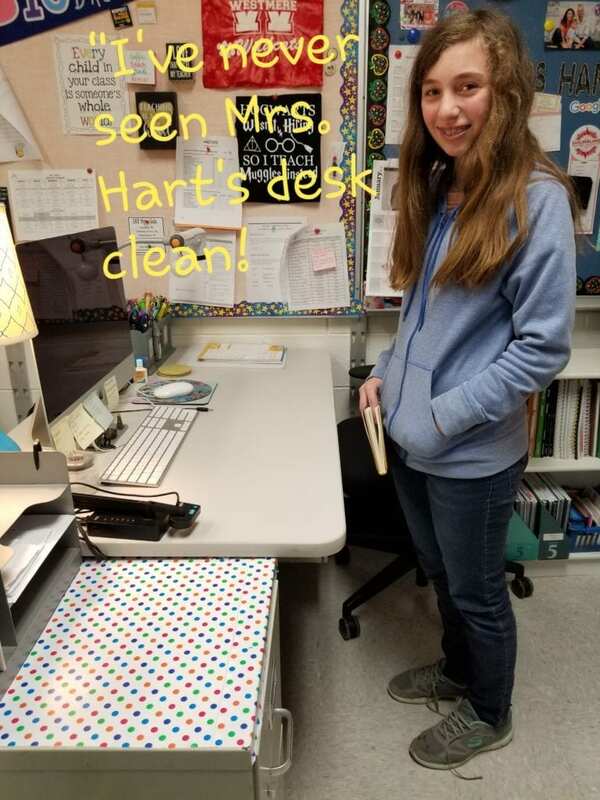 I suggested that she keep them somewhere close to her teacher’s desk, so she could easily see what needed to be taken care of. We looked at her desk. It was … cluttered. We cleared everything off her desk and only put back on what “sparked joy” and what was necessary. We went into her two desk drawers. One had files that she promised to tidy. The bottom one was filled with what Marie Kondo calls “Komono”—miscellaneous odds and ends. Cheri wanted it to hold her personal care items. Soon, after discarding and organizing, the drawer was neat, and it contained exactly what Cheri wanted nearby. 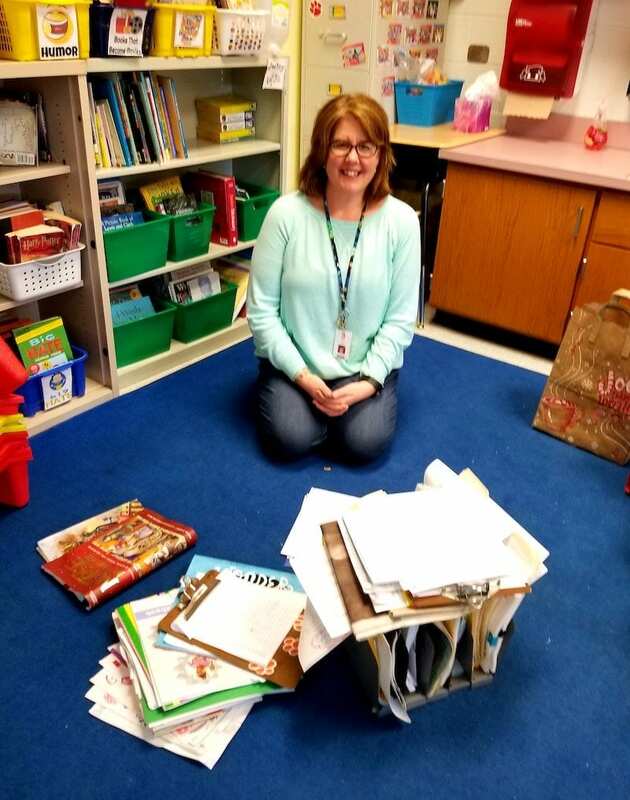 The stack papers Cheri discarded was 15 inches high in the large recycling bin! Her desk and its surroundings were tidy and personal! And so many things had found new homes—keeping “like with like,” so that she could remember where those things were. Cheri had done it. A shortened, modified “Kondofy” was enough to make magic! Cheri asked for homework. So now that she knows the method, she will tackle her storage cabinets next! Then, maybe, books—or not. However, she decides what sparks joy in herself and her students, and she has a better sense of what works in her environment and the confidence to do it. What more could anyone ask for but a happy, organized home away from home?